Pictured here are a first winter male Harlequin Duck (middle) and two male Redheads. Thanks to Brian Bailey for the photograph. Below is the description from Humber College of our park and a few words from the photographers who put together the exhibit using their own images. Sandra Hawkins is an active member of FOSS's steering committee. The Lakeshore grounds, particularly the area that is known as Colonel Samuel Smith Park, is a biodiverse ecosystem with a significant number of animal and plant species. 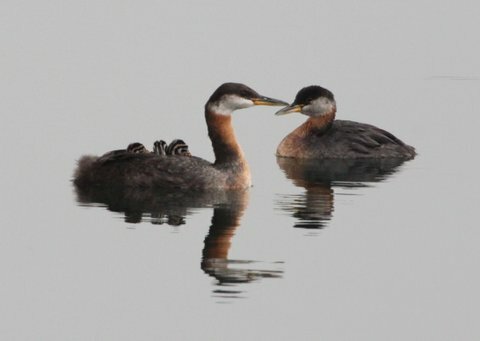 Some of them, for instance, include the Canadian beaver (Castor canadensis), Red-necked grebe (Podiceps grisegena), and the Silver Maple tree (Acer saccharinum). Recently, the park has been officially designated as Environmentally Significant Area. The park itself began its development in the 1970s and officially opened in 1996. The City of Toronto’s waterfront infill project, along with the mature trees and landscaped grounds of the former Lakeshore Psychiatric Hospital make the park what it is today. The South Etobicoke area, which is originally the land of First Nations’ people, offered early settlement for many European military personnel and local farmers. This farming, along with industrialization and urbanization in the 20th century, contributed to deforestation of the landscape, extinction of the Passenger Pigeon (Ectopistes migratorius), and loss of some of local creeks, which were buried completely or altered (www.lostcreeksofsouthetobicoke.blogspot.ca). Today, the park is thriving with wild and plant life. Local Aboriginal groups, Friends of Sam Smith Park (www.friendsofsamsmithpark.ca), Citizens Concerned about the Future of the Etobicoke Waterfront (www.ccfew.org), and Humber’s Centre for Urban Ecology (www.humberarboretum.on.ca/urban-ecology) work to actively preserve and activate Colonel Samuel Smith Park. Colonel Samuel Smith Park is famous as one of the most diverse locations for birdwatching in Toronto; more than 200 bird species have been spotted in this area which inspires artists and photographers to observe these colourful feathered creatures. Artists, hikers, and visitors are attracted to the close and accessible location of the park, striking colours of birds and fantastic views of Toronto from the shoreline. Many local enthusiasts organize free walks and talks for watching and appreciating the variety of birds. These photos represent a gem of green life in the City of Toronto. Next time you take a walk in Colonel Samuel Smith Park, notice the simple natural sounds of birds singing and the reflection of the sun on Lake Ontario. Be sure to visit the park when the trees are covered in snow in the winter, or glistening with dew drops in the spring. Despite the comfort with the benefits of urban life, Torontonians are still drawn to green spaces that have great impact on people’s health. Colonel Samuel Smith Park is South Etobicoke’s space to restore our relationship to the natural world. This online gallery features captivating images taken by Bob and Sandra Hawkins. Their attention to detail, composition, and movement celebrates the rich diversity of native and migrating birds that were seen and recorded in Colonel Samuel Smith Park. "One of our greatest joys is to visit wild places where we may be surrounded by the beauty and serenity of nature. After many years of back road traveling and camping from coast to coast in Canada, we came to the realization that the wild country was slipping away and falling victim to overuse and pollution. We hope our photographs will help to emphasize some of what may be lost if natural habitat is not respected and preserved. We do not employ practices such as baiting owls, luring wildlife with recordings, or intruding into their personal zone of comfort and safety. Instead, we use patience and a certain amount of serendipity to accomplish our goals." You can reach Sandra and Bob at onthewing@look.ca. Let me begin by plainly stating a truth: the beaches in Sam Smith Park are in an awful state! Bits of debris cover just about every square foot of beach and most of this debris is, unfortunately, plastic. Plastic’s been in the news quite a bit lately. Scientists are saying that plastic particles outnumber plankton 36 to 1, that millions of marine animals die each year because they’ve ingested plastic and, because plastic doesn’t decompose , the problem is not going to go away. This news is all the more alarming when we consider that the problem is said to be even greater in the Great Lakes. Take a walk along the eastern beaches of Sam Smith and you’ll find every type of plastic imaginable; spoons, forks, knives, bottle caps, pop and water bottles, toothbrushes, cigarette holders, bags, take-out cups, straws, coffee lids, pails, lighters, chunks of styrofoam, and on and on . You can’t pick up most of this type of garbage because it has broken into little bits just the right size for a turtle, a fish, or a bird to mistake for food. So. What are we going to do? Since it’s unlikely that this sorry state of affairs will change without citizen involvement, some of us thought we had better come up with a plan and we formed a group called StopPlastics. Our mission is to stop plastics at its source. That’s our long-term goal. Our immediate goal is to get the City of Toronto to implement a ban on plastic bags as hundreds of countries, states and cities around the world have done. StopPlastics is asking for your help. We are asking that you contact your councillor and say that you want a ban on single-use plastic bags. If you feel you need a bit of help with that you can visit our web page at StopPlastics.ca to obtain a template letter and background information. Please let us know once you’ve sent your letter by sending an email to us at contact@stopplastics.ca so we can track responses. The Committee at StopPlastics thanks you! The STOPPLASTICS group will be at Sam Smith's Spring Bird Festival on May 28th. and also at the City's cleanup on April 23rd. from 10.30 a.m. to 12.30 where they will concentrate on the plastic litter on Sam Smith's eastern beaches.